Hello my cookie loving friends! I'm so excited to tell you that I'm changing my format a bit. Each week I will specialize on one theme and bring you a ton of tutorials, videos and pictures. If you have any requests, please let me know it the comments! This week my focus will be on camping because I love the great outdoors! 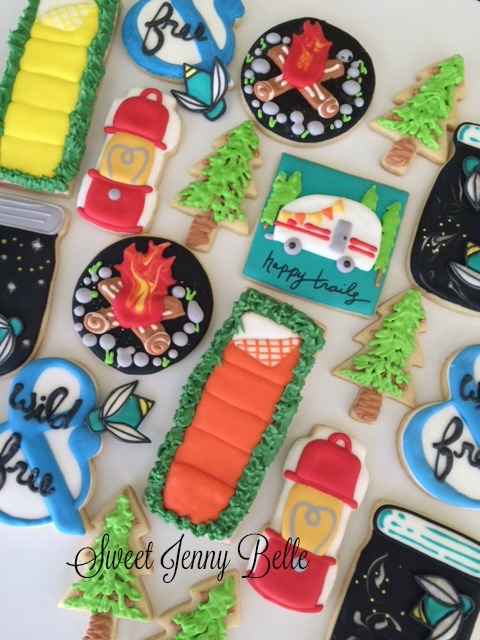 Do you camp or glamp? Where are you favorites places to go? My husband and I love to take our three kiddos out camping in our camper trailer every chance we get during the summer months. We go hiking, fishing and of course eat way too many s'mores! How many of you would buy anything that had a cute little picture of a trailer? I love them! When we go camp over the 4th of July, we bring decorations to spruce it up a bit. And well, who could imagine that great outdoors without oodles of pine trees? Their sweet smell and beautiful presence - a favorite image in my mind. 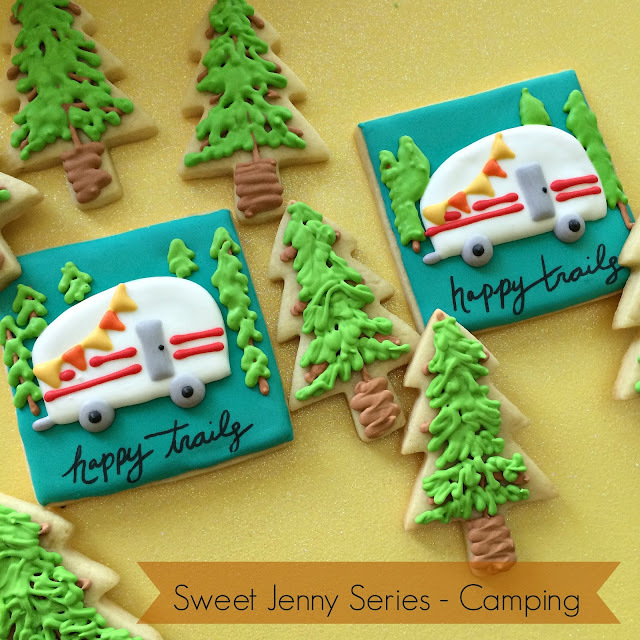 A pine tree cookie is really easy to decorate too! I have a quick video here to show you how I make mine. It's basically just a fancy scribble. Using a thick piping consistency of chocolate brown royal icing, frost the tree trunk. Ice a single line for the trunk and several little lines for branches - a majority will be covered up. Create the pines of the tree using a thick piping consistency of forest green icing. I scribbled up and down the tree leaving some of the trunk and branches showing. So easy, right?? And you could use this for the winter holidays and add snow or ornaments. Want to see the camper trailer in action? Here is a quick video! Come back tomorrow for more camping fun! Those Trailers looks so awesome, i think i could get one for just look a like to my trailer.Thanks for sharing.